Situated in the Mediterranean a hundred kilometers from Italy, Malta is a small island unlike any other. It is often linked to a species of eagle, to knights and also for several decades, to the world of casinos. A popular tourist destination, since the arrival of the first online casinos the small island has become a centre for operators wishing to transparently offer their services to the European market. Through the Malta Gaming Authority (MGA), the small island state is a bit like a police force for international operators on the Old Continent, policing with the same rigour the actual majestic casinos physically present on the island. Even though Malta has had actual casinos since the middle of the last century, the island now gains more revenue and influence from the “young” igaming industry. Since the arrival of the first casinos and following the American embargo, the small island has put in place a specialist institution and a very well constructed specific charter to protect players’ security from the financial giants that are online casino operators. By ensuring the protection and confidentiality of players’ and vulnerable people’s details, a MGA licence is a market leader. Its list of criteria make it quite difficult to acquire and also even more reliable. 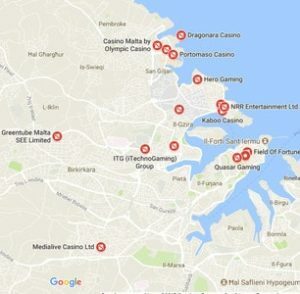 However, even if the online gaming industry is now one of the main sources of revenue for the Maltese economy, its land based casinos give the small island its prestige. Thanks to these iconic establishments that have existed for many decades, Malta attracts every year thousands of visitors from all over the world. The Dragonara Casino, the oldest casino on the island figures among these casinos. Open to the public for over a half century, it has been recently renovated to offer its players a unique gaming area and services to meet all its clients’ needs. The other great names are The Portomaso Casino, Oracle Casino and the Malta Casino by Olympic Casino and in this section on the site, you’ll find our detailed reviews of them. Now a days, online casinos and land based casinos cohabit in Malta and all are regulated by the most strictly enforced security and equity norms around. This cohabitation allows online players to have an exceptional gaming experience thanks to live sections where games are streamed live from these prestigious land based casinos.